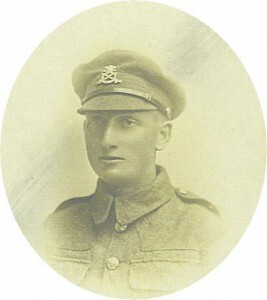 Private William Prothero enlisted at Eastwood, Nottinghamshire, date unknown. 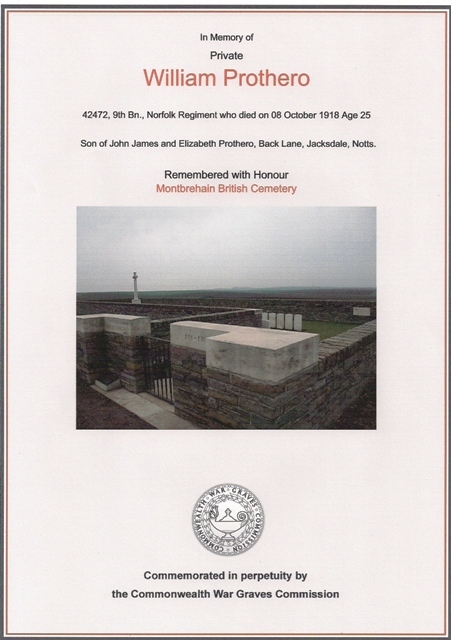 He was killed in action on Tuesday 8th October 1918, only one month before Armistice Day, age 25 . 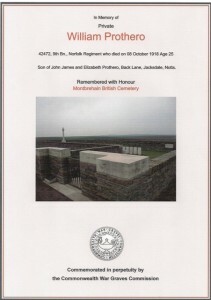 He is buried at Montbrehain British Cemetery, Aisne, France, where 90 casualties of the 1914-18 War are buried. Montbrehain village was taken on 3rd October 1918 by three battalions of the Sherwood Foresters, but it could not be held at the time. It was finally captured, two days later by the 21st & 24th Australian Infantry Battalions. Willie was awarded the British War and Victory Medals. Personal effects amounting to £2 0s 4d were sent to his father in November 1919, followed by a war gratuity of £3 in March 1920. He had brothers, John Thomas, Harry (Henry), Samuel, George and Archie. Harry Prothero is also listed on the Jacksdale War Memorial as having served during World War One and survived, although he was blinded in one eye. Harry was a resident of Dixie Street and had at least one son, named Roy (who was to marry Betty Swain of Jacksdale). Sam was known to have attended Ironville School in 1906, (with fellow classmates, Leslie Lemon, George Wilmott and Harry Heald – all of whom lost their lives in WW1). William also had two sisters, Mabel and Marian. Mabel kept house for brothers George and Archie at the family home on Barrows Hill Lane. George was to remain a bachelor but Archie married very late on in life, sometime in his sixties. Marian married, moving to Nottingham. John Thomas also married taking up residence in the nearby village of Underwood, Notts.